The Clinton Foundation in 2011 employed more women than men but paid them less, on average, according to a salary schedule included in an email released Friday by WikiLeaks... Overall, the average salary for women and men was close. 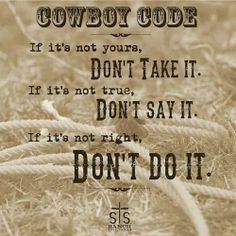 But men out-earned women. 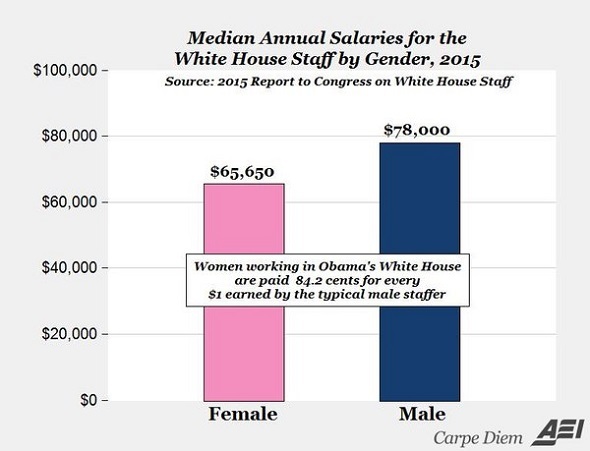 Men earned $68,164 compared to $64,118 for women, on average. The median salary also was higher for men, $55,200 compared with $50,000. Women hold fewer senior-level positions at the Clinton Foundation and earn less than their male counterparts, according to an analysis by The Weekly Standard... But at the Clinton Foundation, the top eight highest-paid positions in 2013 (the latest data available) all belonged to men. Only three of the top 11 belonged to women... In 2012, the top-paid women earned 65 cents to the dollar the top-paid men earned, and in 2013 the gap widened to 63 cents to the dollar. 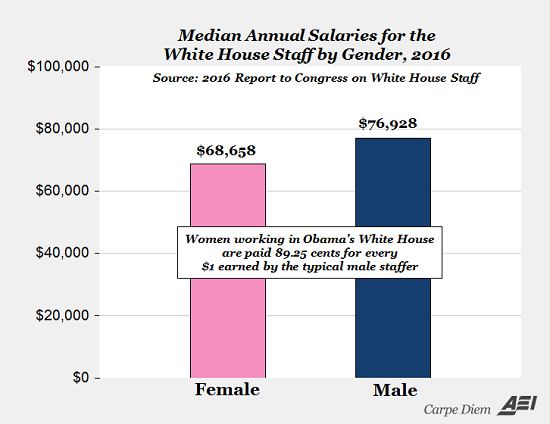 The average male White House employee currently earns about $88,600, while the average female White House employee earns about $78,400, according to White House data released Tuesday. That is a gap of 13 percent. In 2009, male employees made an average of about $82,000, compared to an average of $72,700 earned by female employees — also a 13 percent wage gap. Murray, who has repeatedly accused Republicans of waging a “war [on] women,” is one of the worst offenders. Female members of Murray’s staff made about $21,000 less per year than male staffers in 2011, a difference of 35.2 percent... A significant “gender gap” exists in Feinstein’s office, where women also made about $21,000 less than men in 2011, but the percentage difference—41 percent—was even higher than Murray’s. 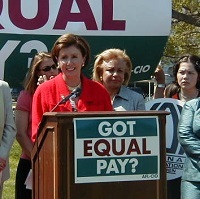 Boxer’s female staffers made about $5,000 less, a difference of 7.3 percent. Most of the Secret Service agents embroiled in a prostitution scandal brought women back to their Colombia hotel rooms before President Obama arrived in town for an international summit, Rep. Pete King said Saturday. King said the raunchy rendezvous involved 11 agents and went sour when an agent refused to pay one of the women, who were presumed to be hookers. President Barack Obama officially declared Tuesday “National Equal Pay Day,” symbolically marking how much extra work women supposedly must perform to reach pay parity with men.